During his visit to Austin where he delivered a South by Southwest keynote, President Obama made time for tacos—specifically Torchy's Tacos, a burgeoning chain beloved by Texas residents. Of course, the president's pit stop at the chain's South First Street location helped give it a major boost on social media. After the president's visit yesterday, the chain scored 7,117 mentions on social media—and there were 287 tweets per minute at 2:05 pm. That's a significant bump. On a typical day, Torchy's doesn't usually break the 200-mention mark on Twitter, according to data from Spredfast. It helps that the president's order was cheekily political; he ordered a Democrat, Republican and Independent, all names of real menu items. 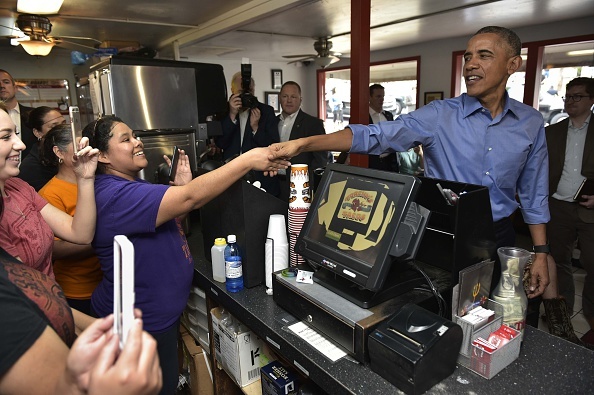 Torchy's clerk tells Obama about the chain's different locations. "So you're trending, huh? I'm here at the right time," Obama says. While Torchy's, which was founded in 2006, is unusually busy every year during SXSW—and right now is no different—a company rep told Adweek that the chain is hopeful about results during the coming weeks to see if the historical buzz could have a long-term impact on sales.